If you're planning on buying or renting laser tag equipment, listen up! Getting the right equipment is a great start, but your job isn't done yet. Understanding how to successfully host, run, and participate in a game makes all the difference. Clearly defined rules, a pre-defined battleground, and an exciting game type are just a few of the factors that go into running a smooth, exciting match. Below we take you step by step through the basics of setting up, organizing, and running your own games. This guide is perfect regardless of the size or complexity of your group. From parents hosting a small match at a home birthday, to an organizer of a large scale tactical match-up, there is something in here for everyone. If you intend on visiting a local laser tag arena or event, you won't be handing the responsibilities that this article outlines. Count the number of players. Decide or vote on the game type. Discuss the rules and mechanics specific to your game type. Divide into teams or groups if needed. Issue the taggers and sensors. Prepare the arena and players. Some paper or a tablet available to record scores. A whistle or other noise making device for starting, stopping or pausing gameplay. The following guidelines are universally accepted across the laser tag world. The first step in running your match should be laying out these rules. Ensure that all players clearly understand each rule. Be sure to print or write them out so that there is no question if an issue arises during play. 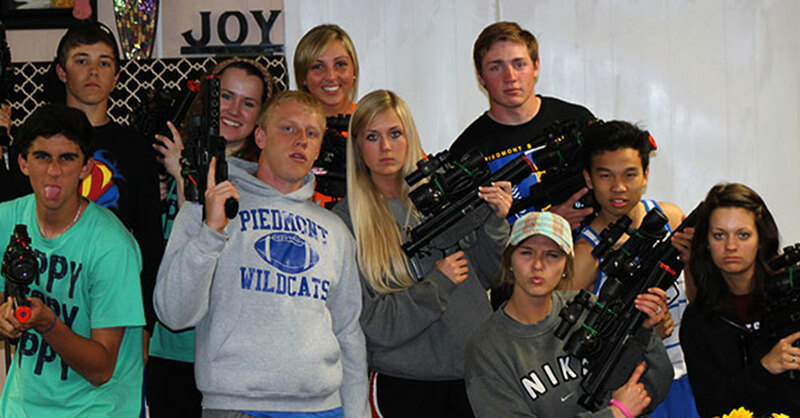 One of the biggest draws to laser tag is how safe the activity is. The biggest thing that enables this is the no contact rule. Any touching, bumping, or hitting of people or equipment is grounds for immediate removal from the game. This rule should be strictly enforced. This rule is second only to the no contact rule. During the game, a player's sensors must be exposed at all time. Any player who covers their sensors to prevent enemies from tagging them will be automatically removed. Obviously this does not include hiding behind obstacles. Situations can get grey here, so be sure to discuss the details of this rule ahead of time. For example if your sensors are attached to your blaster, then putting a blaster under your shirt is not allowed, but hiding it behind your body may be. Sometimes the equipment or scoring systems fail. If the failure is something quick to fix, then get it done and continue the game. If it is a major malfunction consider having the referee pause the game, reset the game, or remove the player. Scoring system failures often require a full reset. The arena and obstacles in it play a big part in your laser tag match. Be sure to set rules around your specific arena. For example if you're playing at home then it should be strictly forbidden to use an object like a pillow as a shield. You can only shoot enemies. Any shots at your own team on purpose and you're out. Some laser tag sets don't allow friendly fire by default which means you can ignore this rule. Designate a referee for each match. Their decisions are final. Make sure there are obstacles to hide behind, but nothing that could get broken in the heat of battle. Set starting points or bases. Set or reset any props. Consider the size of the arena for the number of players and match type. Once you set the map, be sure to do a walk through with players before you start. A map of the arena can also be handy. Before the match, you'll need to decide what type of game you'd like to run. Game mechanics are going to rely on the capability of your blasters and the arena setup. Here we are going to cover game types that can be played with a basic home laser tag set. These blasters allow you to set the team of a player and have a set number of hit points before the player is out. The most basic match type. Two players battle head to head to see who is the champion. This game mode is perfect for play in smaller arenas or at home. If you have more than 2 players, you can create a tournament where players battle head to head to and progress through single or double elimination. This game mode is also perfect for tiebreakers or championship battles. A time limit can be used to keep the pace high. Players start on opposite sides of the arena. There are no boundaries within the arena. Player who tags out the other person out or does the most damage in the time limit wins. This match type is perfect for groups starting at 4 and beyond. You will only be limited by the technology that your blaster can handle. Most home sets handle 4 team settings per blaster. This means you can have as many players as you'd like on up to 4 teams. Teams play against each other. This game type is a great way to build some camaraderie between your players. Even number of players is preferred. Teams start in designated areas, away from other teams. The team that tags out all the other team(s) players wins. This game type can be chaotic, but some of the most fun! Perfect for when you have an odd number and want to include everyone. 3 or more players pit off in a mad free for all. The last man standing takes the prize. Players can start in designated areas away from other players, or randomly scattered across the arena. If the match gets down to two players, you can start a timer to keep the pace moving. The last player standing wins. This is the first of our game ideas that includes props and arena preparation. Two opposing teams face off to capture and return their flag. Each team has a base with a flag. The objective is to capture the other team's flag and return it to your team's base. This game mode is perfect for larger groups and outdoor settings. Best played outdoors or in a larger playing area. Teams start on opposite sides of the playing field near their team's flag. The goal is to fight your way to the other team's flag and return it to your base. If a player who is carrying the flag is tagged, they must drop the flag where they are out. The first team to return their flag wins. If a team tags out the other team, they win. Another take on classic capture the flag. In central flag, two or more teams fight to capture a single flag. The objective is to return the flag to your team's base. The single flag makes this game type a heart pounding experience. Because of the mechanics, it also allows for even larger groups and an unlimited amount of teams. Can have 2 or more teams. Teams start on opposite sides of the playing field. Teams fight their way to the center of the arena and try to capture the single flag and return it to a specified position in their base. The team that manages to return the flag to their base wins. If a team eliminates all the other teams, they win. Splitting in two teams, this game mode tests the defensive and offensive skills of each team. The arena is set up with a base that the defending team must protect. If any of the attacking team members manage to break in to the boundaries of the base, that team wins. The defending team starts inside the base. The attacking team starts as far away from the base as possible. They can start in one location, or spread out. If the attacking team makes it into the base boundaries, they win. If one team eliminates all the other teams players, they win. This game type pits two teams against each other in a test of offence and defensive skills. The travelling group must move from checkpoint to checkpoint until they reach the end of the course. The defending team must stop the travelling team from reaching their destination. The travelling team must move to within the boundaries of each checkpoint in order. The defending team must try to tag out the other team as they move. If a single player from the travelling team makes it to the final checkpoint, they win. If the defending team tags out all the travelling team, they win. In this mode, one person is given a position or other advantage (ie two laser blasters) and must go up against an attacking team. This game mode is perfect for the person that thinks they can take on the world themselves. An optional timer can keep things moving. The hero is situated opposite the attacking team. If the hero is tagged out, the team wins. If the all the team members are tagged out, the hero wins. This list is by no means exhaustive. We encourage you to be creative and come up with your own game types using this list as inspiration. If you have a great game type to add to the list, be sure to contact us with it or leave the idea in the comments below. Once you've clarified the rules and set the game type, its time to start your matches! Depending on your match type, we suggest keeping score so you can reward the winners at the end. A little competition never hurt anyone, and it can make the matches much more interesting. If you follow this guide, please be sure to let us know how it goes in the comments below.